Amazon Redshift Spectrum—a single service that can be used in conjunction with other Amazon services and products, as well as external tools—is revolutionizing the way data is stored and queried, allowing for more complex analyses and better decision making. Spectrum allows users to query very large datasets on S3 without having to load them into Amazon Redshift. This helps address the Scalability Dilemma—with Spectrum, data storage can keep growing on S3 and still be processed. 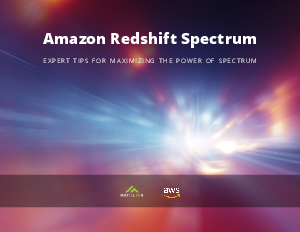 By utilizing its own compute power and memory, Spectrum handles the hard work that would normally be done by Amazon Redshift. With this service, users can now scale to accommodate larger amounts of data than the cluster would have been capable of processing with its own resources.